So, here we are again meeting up for our Wednesday catch up with our blogging friends from around the world. I have since made up a red lining and made up the 12th bag now. Each lining is a different colour so each child will feel special. I'm not sure where I would be without my sewing during challenging weeks and it's so good to know these bags, not only uses up some of my fabric stash but they will be put to good use by the charity....and that's more than enough thanks isn't it? 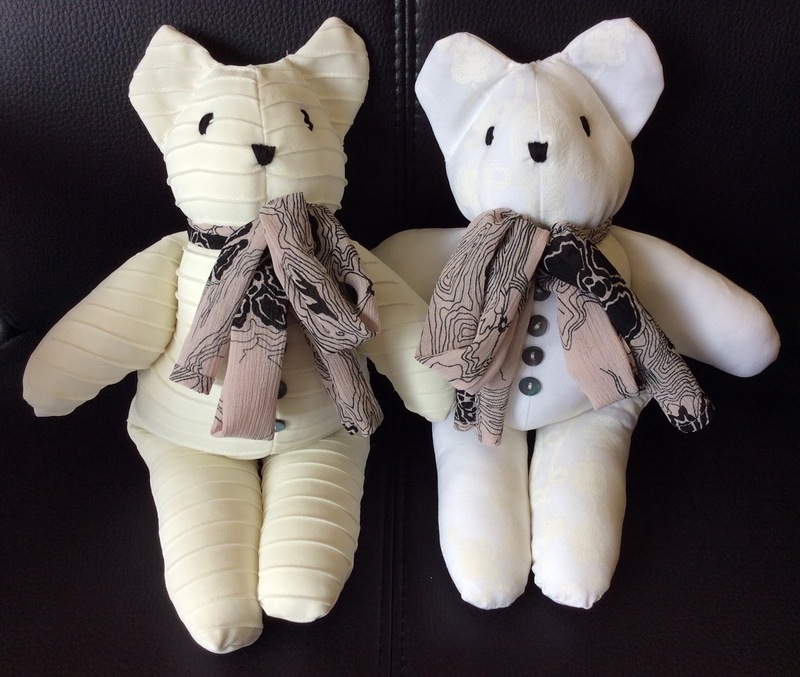 Since making the bags I have had a few more orders for Memory bears....these two were made from a much loved mum's blouses.....a third blouse was used to make the scarves tied around their necks. My customer was thrilled to bits with them and that always makes me happy. This little bear was made out of tiny babygros...they always make a lovely soft, cuddly bear even if I have to cut out very carefully to find pieces big enough to make a bear. I take a photo of every little Memory bear/dog/ rabbit I make and make collages of them for record and to be able to show my customers what I could do and have just printed off the last two pages and laminated them.....I was excited to count up and see that I just need to make 6 more and I will have made 100!! !....that's a lot of memories captured isn't it? The other thing that's on my desk today is some proud nanny sewing I've been doing....sewing on lots of badges for Amy's three little ones. 6 badges each onto the girl's Brownie hoodies then more badges onto all three of their swimming badges.....it's so lovely to see them all achieving. That's all I can share for this week and it's going to possibly be a busy and challenging week for me so I will do my best to return your visits but if I don' get to you this week please forgive me. 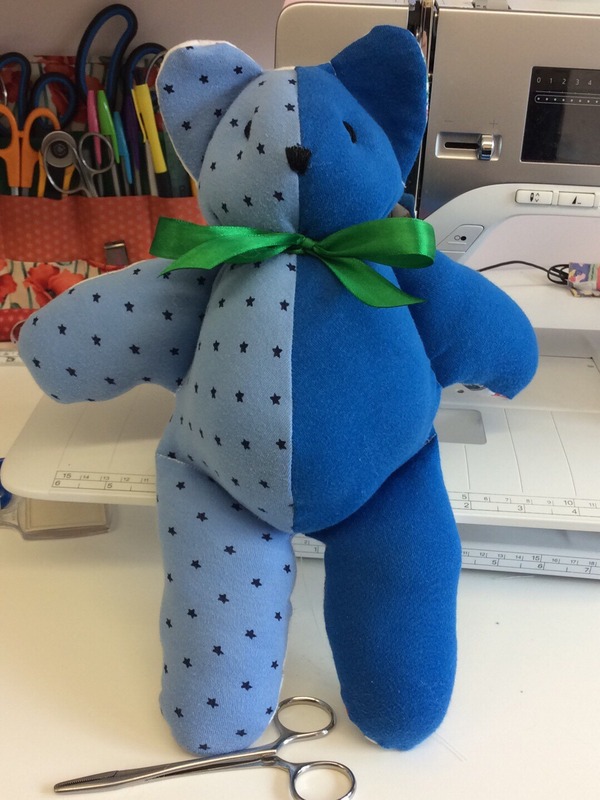 Hi Annie, 100 memory bears will be quite a milestone. Hope your challenging times are on the way out, but glad that sewing is such a comfort to you. Have a good week. Sarah #39 this week. I'm always in awe of your memory Teddies Annie. I'm glad to hear you photograph them all, I'd love to be a fly on the wall and see/hear how they are getting on and what they are all up too. I can imagine lots of adventures. Morning Annie. I can't quite believe nearly 100 bears - I know we have seen lots of photos... but I had never counted them up. That is truly lovely. They are great and obviously people love and cherish them. Well done. Thank you for those bags - they are a wonderful gift for the children in Uganda. I'm off to Adrian and Chris after the weekend, and will be coming home Monday 14 or Tuesday 15 (whether they are all unpacked or not! ), so am wondering if I could call on my way home to pick everything up - and maybe even meet that sis of yours. I'll be in touch whilst away, so can find out how things are going on for you all, and whether it is possible/ convenient... This year's Uganda team are meeting up on May 19, so I shall be able to tell them all about all you two are doing to help them. Take care dear heart. God bless. Well done on the badge stitching - I remember those days well. PS I've been into Julia's Mr Linky account and deleted the old links so your number will be different. Well done on your achieving 100 Memory Bears! Love the idea of the photographs. Good idea with the bag linings, each child will know which one is theirs from the colour of the lining - good thinking! You’re a one woman powerhouse, Annie. Sorry there are difficulties just now and I can empathise that creating beautiful and treasured items definitely soothes the soul. Such a great idea those memory bears & amazed at how many you have made to far.